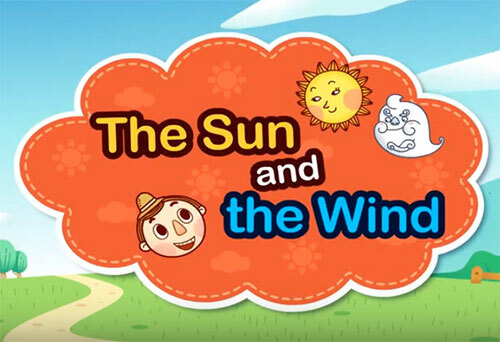 Have you heard about the story of The Sun and the North Wind? It is a story from Aesop’s Fables (Perry Index 46). Different versions of this fable are taught to children all around the world to teach an important lesson on persuasion and power. The Wind was very proud of its power and think’s he is the strongest in the world. The wind challenges the sun with a bet. The challenge was to get a traveller, who was walking through the field below, to take his coat off. The first one to get the man’s coat off would be declared the winner. The wind took the first try and started blowing on the man, but the man held on to his jacket tightly and kept walking forward. The wind wouldn’t give up; he blew even harder and kept trying to blow the jacket off him. But the stronger the wind blew, the tighter the man held his coat. After a while the wind was too tired that he couldn’t blow anymore. As soon as he gave up the sun came forward shined brightly over the man. The traveller was suddenly feeling hot; so he undid his buttons one by one. The sun kept shining. The man felt too hot that he took off his jacket and threw it aside. The wind was so embarrassed, but he learnt an important lesson. When you are gifted with a talent or power it must not make you arrogant and proud. The story teaches us that sometimes persuasion is more effective than force, in which case persuasion is preferable, since it allows the one persuaded to exert free will. Did you like this story? Watch the animated version of the story by clicking on the link provided. The Animated video brings the story to life with vivid colorful characters and dialogues.